WhatsApp is one of the most popular Messaging apps, you can instantly chat, share media, location, and documents. With all these features, WhatsApp would have been a perfect app but it has a little chink in its armor. You can’t send a WhatsApp message to strangers without saving their contact first. I understand that it’s a security feature to prevent spamming but if you are like me, who often have to text electricians and plumber and don’t like to save their contacts permanently, well, there is an easy workaround. Let’s see how to send a WhatsApp without saving contact on both Android & iOS. 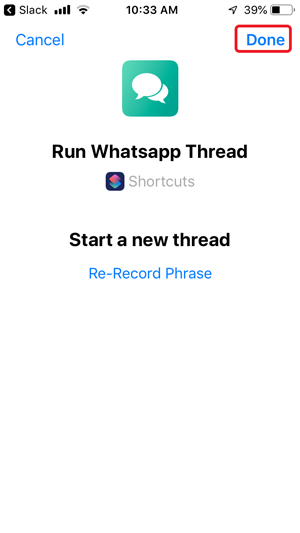 WhatsApp offers an API to start a WhatsApp thread even if it isn’t saved in your contacts. The method works but you have to first open a web browser enter the URL, add the number to the end of the URL and then hit go. The page prompts the WhatsApp app to open. It’s a simple method but you still have to go through a couple of steps to do it. 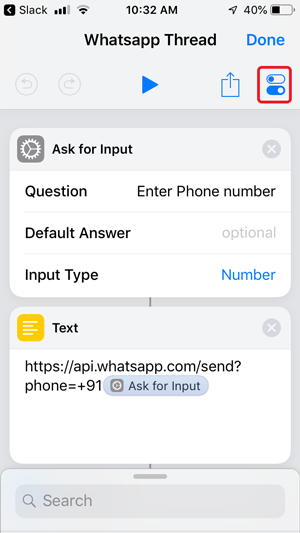 We can automate these steps to a single tap operation using Siri Shortcuts on iOS and Firefox Browser on Android. Siri Shortcuts is an amazing addition to the iOS and it helps you automate long and repetitive tasks. 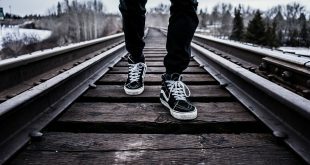 You can create your own shortcuts or download shortcuts made by other users. 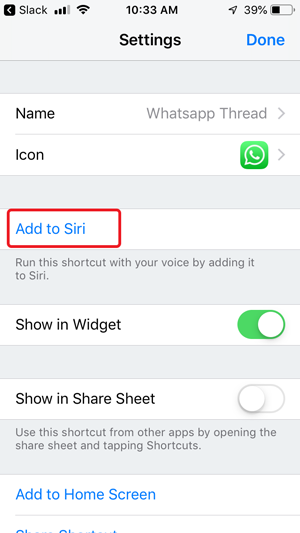 We’ll use a Siri Shortcut to send a WhatsApp without saving a Contact. First things first, you have to install the shortcut on the Siri Shortcuts app. You can click this link to install the shortcut on your iPhone. If you don’t live in the U.S, just change the country code in the Shortcut as shown in the image below. 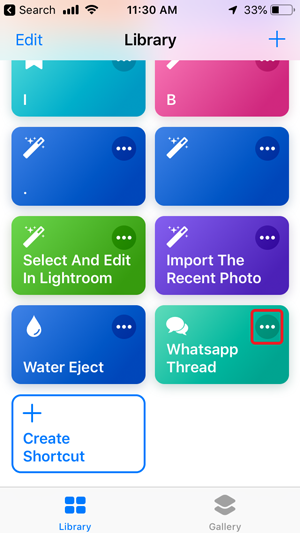 Go to the Shortcuts app and tap the options button on WhatsApp Thread. 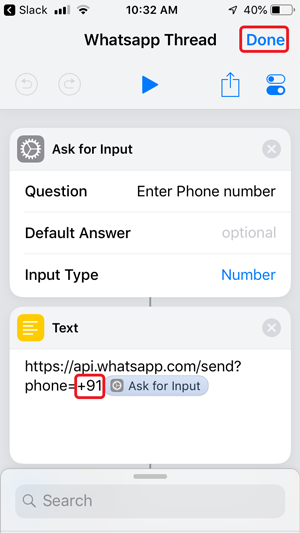 Change the Country code in the text section. 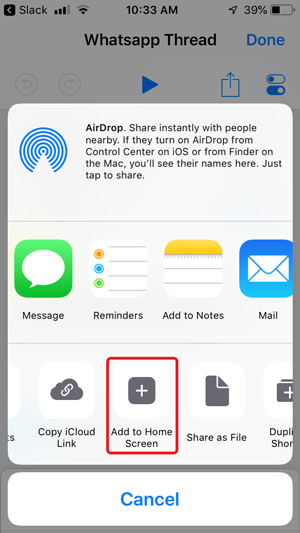 You can invoke the shortcut using multiple ways, you can tap the shortcut in the app, add it to the home screen, or ask Siri to do it for you. To add the Shortcut to your Home Screen, go to the Shortcuts app, Tap the options (three dots) button on your Shortcut and tap ‘Share‘. Select ‘Add to Home Screen‘ and you’re done. Siri can run the shortcuts for you which makes the process entirely autonomous. You don’t even have to press a button and just use your voice to call Siri. To add the Siri commands go the Siri Shortcuts app and tap the three dots. Tap the control center button on the top right and select ‘Add to Siri’. The phrase can be anything you want, tap the record button, say the phrase and tap Done. 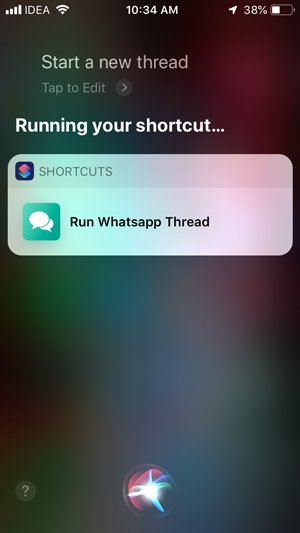 You Shortcut is now ready and you can run it with Siri. 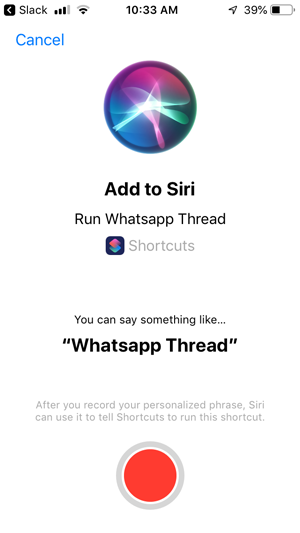 To see it in action, invoke Siri, Say the Phrase to run the Shortcut, Enter the number and start texting on the WhatsApp thread. Once the web page loads, extract the HTML file and open it with Firefox. Go to your Android Phone and open the file with Mozilla Firefox. The page works on any browser but only Firefox lets you add a shortcut to the Home Screen. 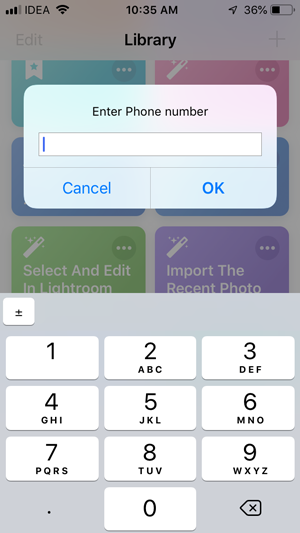 The prompt would ask you to enter the number, cancel it and tap the options button on the top right and bookmark the page. Your bookmark is created. Now go to the bookmarks folder again and press and hold the bookmark you just created to reveal a dialog box. 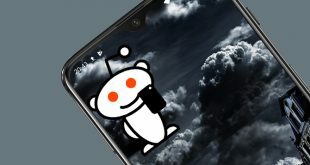 Tap Edit and rename the Bookmark here. Tap and hold the bookmark again and select ‘Add Page shortcut‘. This would create a shortcut to your Home Screen. Place it anywhere on the Home Screen. To send a WhatsApp, tap the shortcut on the home screen and enter the number. There you go, you can now WhatsApp anyone without saving their contact on the Phone. While entering the contact details make sure to add the country code (without the + sign) before the contact number. These were two ways to Send a WhatsApp without saving a contact number on your phone. Siri Shortcuts is certainly the best method to do it on an iPhone. Android has multiple apps to send a WhatsApp but I really like this method because it’s one tap and doesn’t involve any app installation. Which method do you like more? Tell us in the comments below.